A Johns Hopkins University student has developed tiny biodegradable plastic particles that could be used in an aerosol spray to carry DNA vaccines and other important medications deep into human lungs. 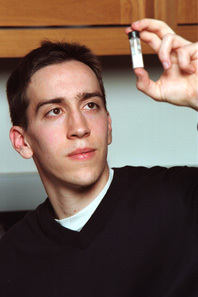 Eric Krauland, 21, a 1997 graduate of North Hills High School in Pittsburgh, Pa., spent last summer in a lab at Johns Hopkins, conducting experiments to produce the unusual drug- delivery vehicles, called cationic polymer microspheres. His efforts were funded through an undergraduate research grant from the university. Krauland's faculty sponsor, Justin Hanes, an assistant professor in the Department of Chemical Engineering, had seen a scientific paper describing similar particles and encouraged Krauland to create a version that could carry life-saving drugs deep into the lungs. The deep lung area, where oxygen enters the bloodstream, may be an effective entry point for DNA vaccines and other medications used to treat ailments ranging from cystic fibrosis to cancer. Krauland began making the particles last summer. First, he formed nascent aerosol particles by emulsifying DNA-containing solutions into polymer-containing solutions to produce tiny droplets. Using freeze-drying equipment, he next removed the liquid, leaving behind hard polymer spheres that resemble a white powder. During this process, Krauland added a surfactant, a material that moved to the surface of the spheres, giving them a positive charge. When they are mixed in a solution with dissolved DNA molecules, which have a negative charge, DNA clings to the surface of the particles. Forming these particles in the lab was not easy. "It took me most of the summer before I could actually make these cationic microspheres," Krauland said. "Then I had to begin refining them so they would work in an aerosol device that could spray them deep into the lungs." 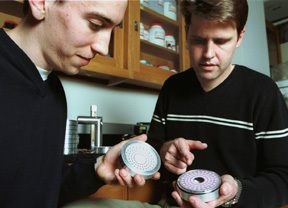 Eric Krauland and his faculty sponsor, Justin Hanes, assistant professor of chemical engineering, at right, discuss the results of a test that shows how well the new polymer microspheres might travel into human lungs. In recent months, he has tinkered with his formula by changing mixing speeds, chemical concentrations and water-to-oil ratios. These variations alter the size, density and surface charges of his particles. Krauland's goal is to produce microspheres that are light and do not stick together when shot out of an aerosol device. The spheres must be capable of carrying large molecules such as DNA and proteins deep into the lungs, where they can be released into the body over a prescribed period of time. Krauland hopes to have results ready for submission to a peer-reviewed journal by late summer and intends to seek a patent for his particles. "It's unusual for an undergraduate to take the lead on a demanding research project like this," says Hanes, the faculty advisor. "But we have some pretty remarkable students here at Hopkins." Krauland completed his undergraduates studies in December but is remaining at Johns Hopkin as a biomedical engineering master's degree student. As one of 43 Johns Hopkins students who received Provost's Undergraduate Research Awards in the 2000-2001 academic year, he will present an overview on his project during upcoming awards ceremony. The event will take place 3 to 6 p.m. on Thursday, April 5, in the Mattin Center on the Homewood campus, 3400 N. Charles St., in Baltimore.